Frances Winston reviews this latest version of A Star Is Born, starring Bradley Cooper and Lady Gaga. If the title of this film sounds familiar, it is because it is actually the third remake of this classic story of a fading star, who takes a rising star under their wing, and the complications it causes for their relationship. The original in 1937 starred Janet Gaynor and Fredric March, and was a straightforward drama. The 1954 adaptation featured Judy Garland and James Mason, and added music to the mix. This is probably one of the best-known versions, marking as it did a movie comeback for beloved star, Garland. In 1976, Barbra Streisand took on the role of the up-and-coming talent, with country star, Kris Kristofferson, playing her fading mentor and love interest. And now, in this latest offering, the task of playing the star-crossed, ill-fated couple falls to Bradley Cooper and Lady Ga Ga – not a screen combination I ever thought I’d see in print, if I’m honest. A Star is Born is something of a labour of love for Cooper. He stars in it. He co-wrote it. He directed it. He co-produced it. However, this is not a vanity project, and despite captaining the ship, he doesn’t hog the picture, instead allowing the story to breathe, and other people their chance to shine. He plays the fading star, Jackson Maine. Once a music God, a combination of tinnitus and hard-drinking and drug abuse are taking their toll on his life and career. After a show one night, he finds himself in a drag bar, simply looking for a late drink, but instead he encounters Ally, a fed-up full-time waitress, who aspires to be a singer, performing La Vie En Rose. Immediately smitten, much flirting ensues, and before you can say private jet, she’s joining him on stage, and the pair are writing music together. However, when Ally’s talent gets noticed in its own right, her star ascends as his burns out. Jackson struggles to cope, and their relationship is tested to the max. I must admit that I was dubious about this film, prior to the screening. Cooper has no musical pedigree that I could discern, and Ga Ga is a seasoned and outlandish pop veteran, and hardly a naïve hopeful. Although she has previously acted in American Horror Story Hotel, she basically played a version of herself, and wasn’t exactly stretched. However, in A Star is Born, she is completely stripped-back and make-up free, and a million miles away from the meat-dress-wearing superstar we are familiar with. For his part, Cooper is actually very credible as a hard-living music star, and has an impressive voice. The pair have a fantastic chemistry and gel musically, which is just as well, as the whole movie hangs on this central relationship. Sam Elliot must also get a special mention for a brilliant performance as Jackson’s older brother, who has been helplessly watching him self-destruct for years. While there are parts of the story that are somewhat incredible, and some dramatic licence is taken, overall A Star is Born is well-paced, and the development of Ally’s career is juxtaposed nicely with the decline of Jackson’s. This is helped by the fact that it is beautifully shot. For a first-time director, Cooper resists the urge to shoot by numbers, and instead utilises some very stylish live-music shots, and juxtaposes them with sedate at-home shots of the pair. 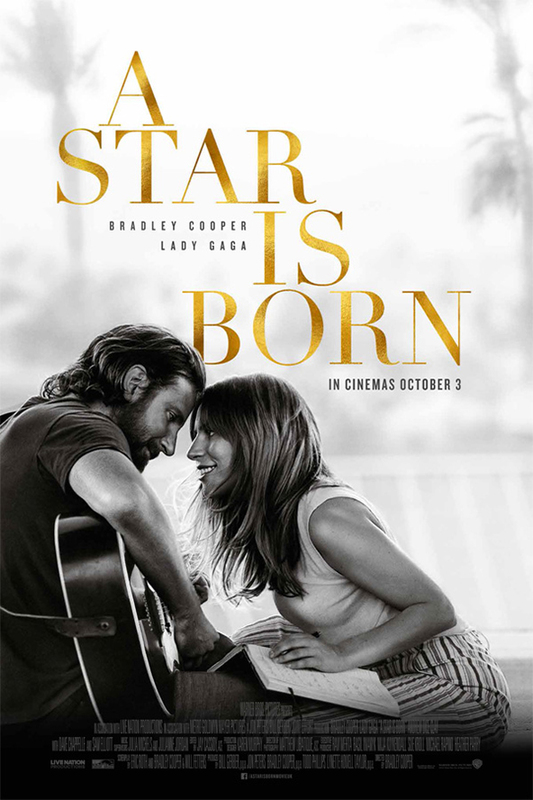 In terms of the soundtrack, the songs are all definite ear-worms – particularly the main track, Shallow – and will be stuck in your heads long after the credits role. These are perfectly credible, well-crafted songs, and each track could be a standalone hit independently of the movie. This also adds an authenticity to this offering, which can often be lacking in this sort of movie. In fact, at times, A Star is Born feels more like a biopic, and you have to remind yourself that these are fictional characters. At the end of the day, you really care about what happens to Jackson and Ally, and even though those who know the story will know the ending, you’re still not quite prepared for it when it happens. This is a completely engaging story that – to use the cliché – will take you on a journey with the characters. The hype around this movie is justified. Far from being a tired rehashing of an oft-told story, this version breathes new life into the tale, and is more than worthy of you admission fee.